We take a look at the best truck sat navs on the UK market in 2018. Jump straight to the reviews. Driving a truck is relatively easy – you just need to pass a corresponding driving test, memorize what each little button does, and you’re set to go, right? Well, even though the aforementioned statement might be true, there’s lots more to it than just that. Namely, truck drivers need to be focused on both the road and the traffic, as even the most trivial of mistakes could make their trip a living hell. For example, imagine you took a wrong turn. In some cases, you’d just have to go around, making the trip a bit longer. In other cases, you’d have to backtrack, wasting both precious time and fuel. There must be a way to make things a bit easier and less stressful, and that’s where the best truck sat navs come in to play. Most truckers use various navigation systems to help them take a load off their mind, and it just happens to be the most convenient mean of fighting stress and making the trip a bit more bearable. 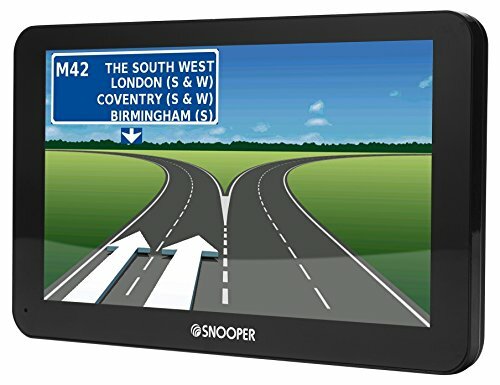 However, there are plenty of manufacturers of navigation system units, and choosing the best one for you might be more difficult than you initially thought. Luckily, our reviews of the best truck sat navs in 2018 should help you with that. First though, let’s take a look at how sat navs work. How do sat navs work? The technical details regarding how sat nav systems work are extremely complex, but you don’t have to fret about it too much. As each brand uses different hardware and technology to manufacture their system, it’s virtually impossible to lay down a set of accurate rules about how each system works. What we do know is that all sat nav systems serve the same purpose. Basically, every truck sat nav uses a form of GPS (Global Positioning System). These systems use information transmitted directly from the orbiting satellites, providing them with insight regarding the driver’s position and the surrounding area. What’s important to note is that nearly all GPS units are extremely accurate – you’ll be able to pinpoint your exact location with surgical precision. Furthermore, in the latest examples this information is transferable between vehicles (outfitted with GPS system), so that drivers are able to coordinate more easily on their route. Each sat nav unit comes outfitted with a different set of maps. Of course, maps of nearly all known and traversable areas are available to either buy or download, but the factory-included maps are one of the factors we use to differentiate sat nav systems. For instance, some of the most popular truck sat navs feature European mapping (which includes maps of roughly 45 Euro countries) and more advanced truck sat nav units which feature full-world mapping (maps of over 100 countries are included). You’ll notice that a sat nav features a limited internal memory – this means that some maps won’t be pre-loaded on the device, so you’ll have to manually download the ones you need via manufacturer’s website. There’s a more convenient way to ensure that your maps are always up to date, though – newer modern truck sat navs come supplied with a feature called “lifetime map updating” which simply updates the maps whenever one is available. It’s clear that there’s no such thing as the “perfect” truck sat nav – such a model would include all of the features we laid out below, but if you’re looking for the best truck sat nav for the buck, it should have as many of them as possible. Live updates of traffic events and circumstances would greatly save you time. This feature allows you to anticipate traffic jams with moderate accuracy (good substitute for local news reports regarding traffic). Safety first should be everyone’s motto, and that particularly applies to truck drivers. Basically, this feature will notify you if any environmental hazards have hit the area you intend to traverse, or if any road works are under way. Accidents on road are not only possible, but frequent. That means that you’ll always have to be ready for the worst case scenario. If your phone battery dried out and you have no other means of contacting emergency services (car tow, medicinal help), this feature will be of much use to you. Generally, truck sat navs aren’t powered by Bluetooth, rather some models feature Bluetooth technology which allows you to undertake hands-free calls. This makes driving and speaking on the phone less dangerous. Unpredictable lanes are as much of a threat as a wrong turn. Using the lane guidance feature, you’ll be able to ensure that you’re driving in the correct lane at all times. This isn’t a necessary feature, but it could immensely help you get around certain places. For instance, most POI-compatible truck sat navs will show you local point of interest, such as restaurants, toilets, car repair shops, etc. The 3D map rendering allows you to stretch your maps onto a three-dimensional platform. This can help you get a better understanding of the curves, heights, hills, slopes, and similar geographic landmarks in the area you are driving in. The screen size is very important. Small-sized touchscreens are difficult to use as the information on them is harder to see. On the other hand, screens that are too large might not be able to get attached onto your deck. The voice recognition feature allows you to interact with, otherwise manually accessible features. Again, this is not a necessary feature, but it’s certainly convenient to have it. Our absolute, undisputed winner is TomTom’s Go Professional 6250 GPS Truck set nav. It’s the single most versatile GPS unit which every trucker needs, regardless of the march route. First of all, TomTom’s Go Professional 6250 GPS Truck set nav comes outfitted with a 6-inch touchscreen. The size of its display is pretty big, but it’s still within the borders of convenient. You’ll be able to see every single detail on it and you won’t have to bother too much about finding the right feature like you would on a small-sized touchscreen. One of the best features of TomTom’s Go Professional 6250 GPS Truck set nav is the customized large-vehicle routing. It combines several convenience features into one, including lane assistance, and plain vehicle routing which simply sets the keypoints along the route. You’ll get to benefit from the lifetime full EU truck map (approximately 45 countries) which is automatically updated whenever an update is available. Furthermore, you can make use of the integrated traffic to avoid jams and save some time along the way. There’s a built-in Wi-Fi onboard which you can use to easily update the software wherever you may happen to have access to the Internet – this excludes the need to carry this unit to your home and manually update the software. Moreover, TomTom’s Go Professional 6250 GPS Truck set nav features the latest Bluetooth integration. You can rest assured that all your future calls will be completely hands free. Apart from that, the last convenience feature is the smart-phone message notifications application which serves as a modern pager. Now, our winner excels in numerous fields of performance, but there are certain things people didn’t seem to like as much about it. For instance, we deliberately left out the third party POI feature as it’s a bit mediocre. Namely, most truckers which used this sat nav reported that this feature is pretty much useless. Even though this might or might not be too helpful, it’s important to note that UK truck drivers should consider our other options. Basically, the EU maps are all working properly, but certain parts of London aren’t thought through to the detail. Overall, TomTom’s Go Professional 6250 GPS Truck set nav is the ultimate set nav unit which boasts a superb value for the price. 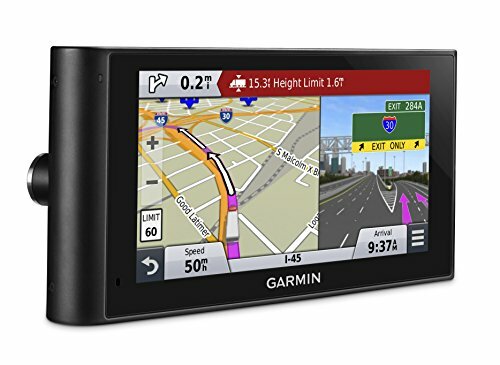 Our first runner up is Garmin’s 6-inch DezlCam truck sat nav system. Essentially, this is a 6-inch truck sat navigation unit which comes outfitted with a built-in dash camera, along a plethora of high-quality features. Now, the DezlCam truck satellite navigation was a real “boom” on the market when it came out, but sadly, that happened a few years back – now there are models that can compare with it in terms of performance, it’s still one of the best truck sat navs on the market and is easy to use, which is one of the reasons why we’ve decided to label it as our runner up. First of all, Garmin’s DezlCam truck satellite navigation features a large 6-inch widescreen display. It’s large enough for you to conveniently select the features you want to use and see every detail on the road with ease. The menu is remarkably easy to navigate, mainly due to the simplified method of operation. You’ll be mostly using two features – the “Where To?” feature which will prompt you to enter the designated address and “View Map” which will allow you to expand the map on a larger scale. The best feature it has, however, is the built-in dashcam. This onboard camera allows drivers to record their journeys, providing additional security in situations when something goes awry. Using it is very simple – the huge red button is all you need to press to start recording (found at the top near the lens). You’ll be able to record HD videos in 1920 by 1080 pixels at 8 megabytes per second – if your recording lasts for hours, it will be divided into 1-minute chunks of sixty megabytes so that you can review them more easily later on. Garmin also implemented their “live services”. Various services are provided through the DAB radio (a receiver is built into the cam) which updates the traffic display as fast as every minute – as opposed to most standard FM-based radio systems. The live services proved to be extremely accurate, covering the majority of areas and roads, including those minor ones as well. The only bad thing is that this feature is a bit “exclusive”. Namely, you’ll be able to use digital services for life, but the digital traffic works for a small number of EU countries only (UK, Belgium, Germany, Norway, Netherlands, and a few others) while others use the standardized RDS-TMC coverage. There are several things which could be improved, though, which are also the reasons why Garmin is a runner up after the TomTom’s Go Pro sat nav. First of all, the digital traffic only works for certain countries (which we already mentioned), but the processor power leaves a lot to be desired too. And some people indicate that the screen is a bit too reflective for comfort, but that’s certainly not a deal breaker. Overall, Garmin’s DezlCam truck sat nav is great for the cash. It’s not cheap, but it offers the simplest means of navigation with superb reliability and accuracy. You’ll notice that our top pick – the TomTom Go Professional bears the label of “6250”. We’re now reviewing the “6000”, an earlier version which comes with a similar set of features. One of the main reasons why you should consider this truck sat nav is because it offers similar benefits when compared to the improved version, but at a cheaper price. First of all, the widescreen is pretty standard in size, being 6-inches wide. It’s easy to navigate the menu and use the onboard features due to large display and buttons. 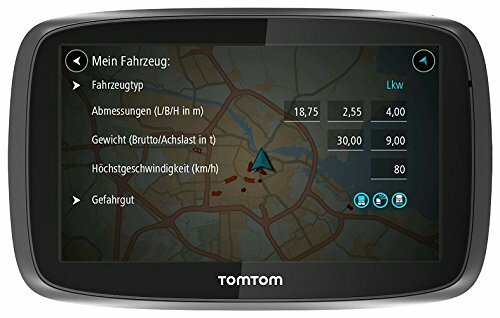 The “Customized” large-vehicle routing feature is installed in this unit as well (we’ve first seen it in TomTom Go Professional 6250). This particular model is heavily improved when compared to the earlier versions, such as the Go 500, and includes onboard wireless data which those prior versions don’t. You’ll get to use the full EU maps (with all 45 countries) along with the lifetime updates, which basically means that you’ll be able to enjoy these maps for free, forever. Speaking of “free”, you’ll be able to use a 3-month trial version of the “speed camera location” feature, otherwise the service costs some twenty pounds a year. If you happen to opt for not updating your trial version, the warnings will not stop and the software will remain un-updated. Another terrific feature is the advanced lane-guide that simplifies the way you’ll use and cross through lanes. As opposed to standard lane guidance features, this feature is a bit more advanced, meaning that it’s faster, more accurate, and just slightly more reliable altogether. This unit, however, doesn’t feature the guidance through A-roads or motorways. Most truckers don’t seem to be bothered too much by it, though, but note that most high-end truck sat navs are outfitted with it. If you’re an edgy person who wants something done as soon as possible, you won’t like TomTom 6000’s only real flaw. Namely, every feature lags just a bit. Opening the menu and using the features are followed by small delays, which shouldn’t hurt if you drive at a steady pace, but it could mean a lot if you don’t. Anyhow, TomTom’s Trucker 6000 GPS sat nav works like a charm – it doesn’t cost too much, but it certainly isn’t cheap either. It provides a great deal of benefits which are more than capable of outshining the small flaws we’ve described. Our best value pick is ideal for people who have a bit more side money to spend and who are also looking for the best truck sat nav for the money. Of course, our top pick TomTom’s Go Professional 6250 is just a bit better, but Snooper’s Truck Mate is not too far behind. You’ll notice that this truck sat nav comes outfitted with some very special features which are clearly different from what we’ve seen so far, making it unique. One of the best things about Snooper’s Truck Mate S8110 is that it allows you to benefit from “specific routing” which is based on the parameters of your vehicle. This means that you’ll not be guided to the closest road and through the shortest path, but rather you’ll be directed to the route which is best for your particular vehicle. You’ll be able to use the Bluetooth technology to make your calls hands-free, and another thing that’s free is the real-time TMC traffic information. Speed camera location feature is also available, but you’ll have to subscribe (and pay an annual fee) to use it. Additionally, this feature is enhanced with the “my speed” option – it will display the road-speed limit for a road you are taking. The only thing that’s not so good regarding the Truckmate S8100 is that it costs quite a lot. In fact, all truck sat nav units are pricey, but the S8100 is more so than most. Anyhow, it does a superb job and is well worth the money. We’ve come to the last of our reviews of the best truck sat navs on the UK market, and we’re pulling the curtain down with Mio’s Spirit 8670 LM truck navigation system. This is the most affordable option we have in store for you today, but don’t be dissuaded by its low price – the Mio 8670 is a formidable truck sat nav, and even though it can’t really compare with the higher-end models it does a good job for the money. First of all, it features a 6.2-inch touch screen. That’s just a bit larger than your average widescreen display, but the difference is barely even noticeable. What’s more, you’ll be able to use Mio’s desktop application if the regular way presents a problem for you. Bluetooth technology is included, although the version is not the most up to date – it does the same thing, but with less reliability and efficiency. You’ll be able to benefit from the road speed-limit feature which provides information on speed limits as well as with parking assistance: it basically makes every trip a bit safer and just a tad easier. The unit comes with a set of full EU maps (with a total of 44 countries) with a bonus of lifetime updates. 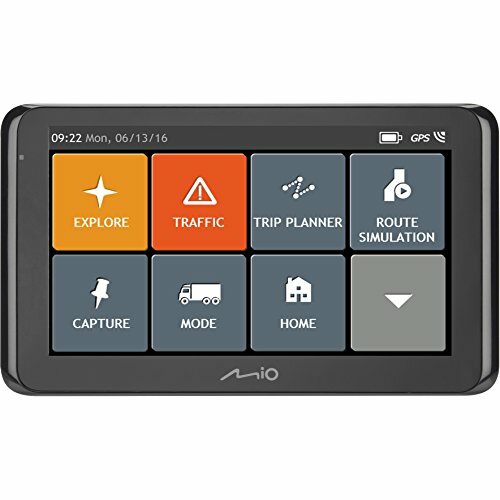 Essentially, Mio’s Spirit 8670 LM truck navigation system is excellent for truck drivers who aren’t willing to spend a fortune on a truck sat nav. It does the job fairly well, although its performance is mediocre when compared to other models in our reviews. Finding the best truck sat nav is anything but easy. There are numerous brands that are interested in selling you their model, which makes the competition quite stiff. You can easily get lost in the maze of sales promises without having the ability to discern the true ones from the false. That’s what propelled us to compile these reviews of the best truck sat nav models in the year of 2018. Each of our top 5 picks is sure to serve you well. 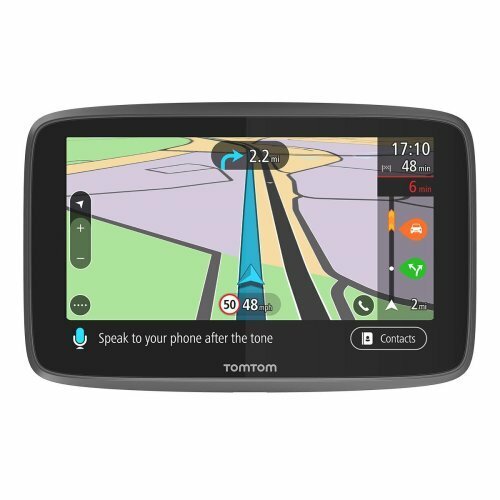 The first model reviewed above is our very own favourite, as well as the winner of the roundup, the TomTom’s Go Professional 6250. That said, we’d be perfectly happy with any of the other models here. Copyright © 2019. Jamojo Ltd. All rights reserved.